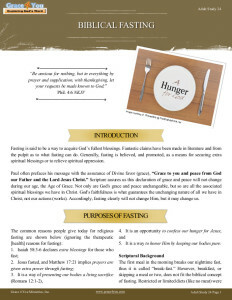 Study 24: Biblical Fasting | Grace 4 You Ministries, Inc.
Fasting is said to be a way to acquire God’s fullest blessings. Fantastic claims have been made in literature and from the pulpit as to what fasting can do. Generally, fasting is believed, and promoted, as a means for securing extra spiritual blessings or to relieve spiritual oppression. Paul often prefaces his message with the assurance of Divine favor (grace), “Grace to you and peace from God our Father and the Lord Jesus Christ.” Scripture assures us this declaration of grace and peace will not change during our age, the Age of Grace. Not only are God’s grace and peace unchangeable, but so are all the associated spiritual blessings we have in Christ. God’s faithfulness is what guarantees the unchanging nature of all we have in Christ, not our actions (works). Accordingly, fasting clearly will not change Him, but it may change us. It is a way to honor Him by keeping our bodies pure. The first meal in the morning breaks our nighttime fast, thus it is called “break-fast.” However, breakfast, or skipping a meal or two, does not fit the biblical concept of fasting. Restricted or limited diets (like no meat) were followed by Daniel and Ezekiel, but were not called fasts (Dan. 1 and 10; Ezek. 4). Similarly, abstaining from certain foods today (meat, chocolate, dairy…) has no biblical precedence for calling it a fast. At least 77 biblical passages refer to fasting. The Hebrew root word for fast means “to cover over the mouth,” and the Greek word means “abstinence” (either involuntary from lack of food, voluntary, or for religious purposes). Biblical fasting refers to cessation of eating; it does not necessarily consider drinking. Biblical fasting carries the concept of a total cessation from eating. “Fasting is the practice of self-denial, either as a spontaneous expression of grief before God in the face of unexpected disaster (Judges 20:26; 1 Kings 21:9; Esther 4:16; Jer. 36:9; Joel 1:14; Mt 9:15) or deliberate”. In the vast majority of verses, those fasting were experiencing great distress and anguish; Paul reinforces by saying, “in weariness and toil, in sleeplessness often, in hunger and thirst, in fastings often, in cold and nakedness” (2 Cor. 11:27). The purpose of a fast was to afflict and humble the soul, “… that we might afflict ourselves before our God, to seek of him a right way for us,” (Ezra 8:21, KJV). In addition to fasting and prayer, those fasting generally sat in sackcloth, put ashes on their body, rent their cloths, wept (Judges 20:26), and expressed deep sorrow to demonstrate a broken heart to God. Daniel says, “Then I set my face toward the Lord God to make request by prayer and supplications, with fasting, sackcloth, and ashes” (Dan. 9:3). It is important to remember the biblical combination of all these practices. The sincere faster’s prayers were often answered as requested; thus, fasting, and all that went with it, seems to have influenced God. Fasting was not an act by itself that had any merit. Fasting did have merit when it was in response to distress and coupled with sincere anguish, sackcloth, ashes…. The idea behind fasting was that during a time of great distress and anguish, a person could demonstrate his or her sorrow through personal affliction. The goal was to petition God to hear and answer prayer.